This was so hard. Oh my goodness, I'm not gonna lie. But I've been compiling photos for lots of "my favs" and "top 10's" lately and this one kept missing the cut but I love this one..so I MUST share it somewhere somehow. My son has a great face, the best one in my book outside of my husbands since they're almost identical twins minus my husband's facial hair and "manliness" but you get the idea. 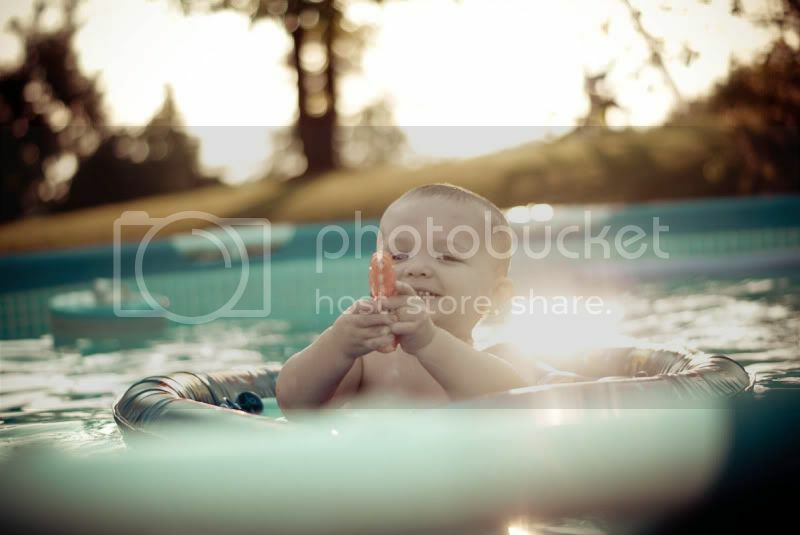 This was so cute of him with his lil water gun and the sun reflecting off the water in the pool. I love my little man! This is my entry for I Heart Faces' best face of 2010! To see more go to the site by clicking the button below. This time instead of the I Heart Faces team choosing the winner..WE vote for our favorites. So if you like this photo of this seriously sweet lil guy, please go to I Heart Faces after the linky closes tomorrow at noon and cast your vote for him! Thank you! Lovely entry for I Heart Faces! I love how the reflection drawls you into Dillon's cute little face. I, also for the first time, entered the I Heart Faces Challenge. Now I wish that I had chose a different photo. Don't get me wrong the photo that I posted - I.FRIGGIN'.LOVE but I had another one that may have been a better entry. Oh well, I cant cry over spilled milk. I love this. Too cute! gosh. i love the colors and sun flair here...the angle and perception is perfect. Great photo. What I love most is the cheeky expression on his face. Brilliant! I love the face...but that light is so beautiful. Oh what a face.....simply perfect. Perfect photo choice for I heart faces! whoa. LOVE the light, love the expression and the colors - the blue tones. LOVE IT. great photo! Love the awesome blue tones. Great shot! Such a great choice, Natalie! Love that little grin. And, your macro in the post above is stunning! Ok, so I completely love this picture - everything about it! It's just perfect, exactly how I wish all of mine would turn out. Great one!